Sky's the limit for seagulls in South West! 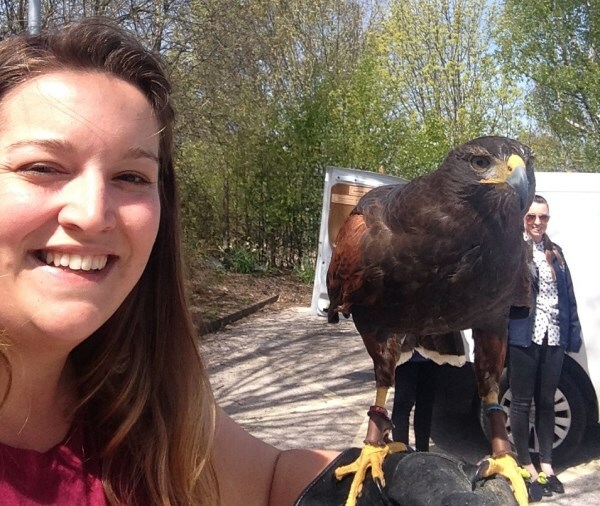 Staff from our South West region got up close and personal with a Harris hawk called Sky at their offices in Exeter recently. Sky is an employee of Hawksdrift, a local bird control company, and earns her corn scaring off seagulls from office buildings and surrounding areas. Here are Marketing Co-ordinator Leigh Biddulph and Marketing Manager Kate Brown coming face-to-face with Sky as she took a break from her work at the Bovis Homes regional headquarters at Sowton Industrial Estate. "She was very friendly, but I think that was mostly because we had steak!" said Kate. "She was a real character. Apparently there were around 250 seagulls on the roof when they first arrived, and by the time we went down to meet them there was only about a dozen!" Four-year-old Sky is currently moulting and weighs in around two pounds. She is mentoring a 10-month-old called Jack, who is still learning the ropes and was relaxing in the van when these pictures were taken! 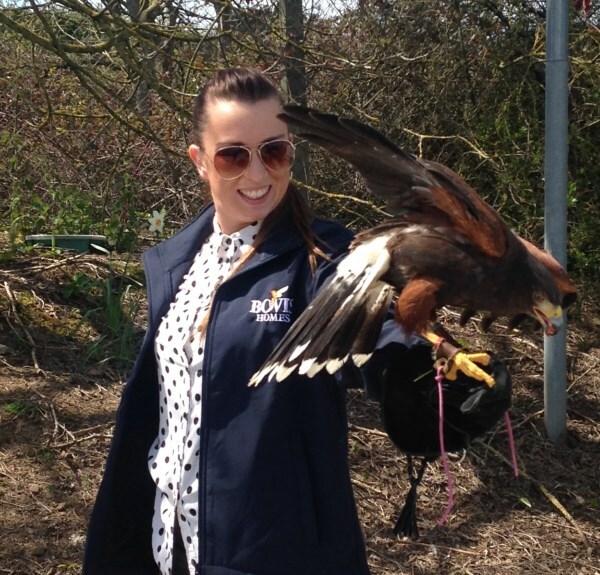 Originating from an area covering south west United States down to Chile and central Argentina, Harris hawks are medium to large birds of prey with dark brown and chestnut plumage and a white-tipped tail. They occupy sparsely covered habitats including semi-desert, woodlands, marshlands and mangroves.